Miss Singh: CHICAGO BROADWAY SHOW! Yesterday, My sister and I ended up doing a girls night out and went to go see our first Chicago Broadway show. I have been to Broadway shows in New York, but not in Chicago and was super excited when we got tickets. 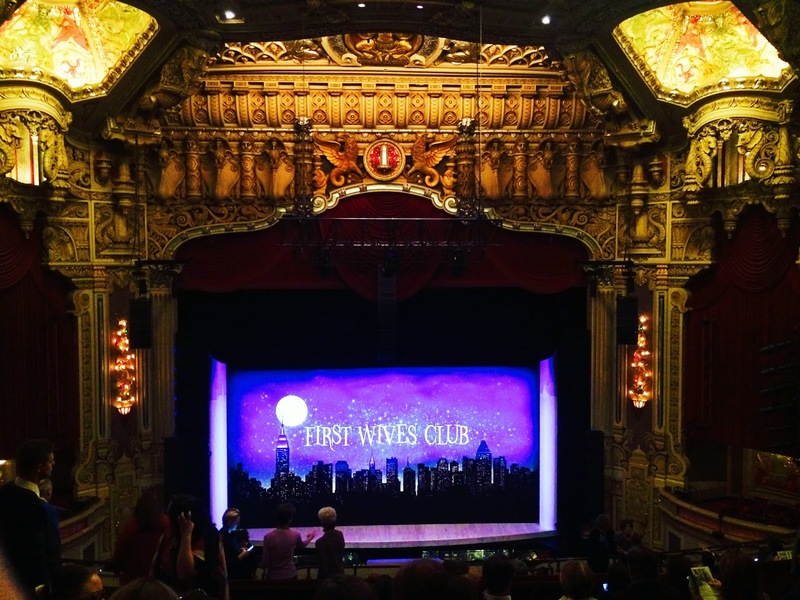 We decided to go see the show, First Wives Club. It was such a lighthearted, hilarious and super entertaining show. I highly recommend it for a girl’s night! First Wives Club is based on the smash hit 1996 film and Olivia Goldsmith’s bestselling novel where three former college friends reunite after they are ditched by their respective husbands for younger women, they band together to settle scores with the men who did them wrong. Super girly, but super fun! I threw in a little whats in my bag of the night in here! I decided it would be interesting to show you all what I carry in my bag when I am out for a night like this. My bag is from a small boutique and I absolutely adore it. It's red leather with studded detailing. I love finding unique things like this at stores around the city! Now on to the stuff I had in this little bag! Guys! I have really cut down on how much I carry in my bag! Trust me, I used to be a mad lady with my purses, but now I only carry basics. I had my keys in my coat pocket so I had more space for this stuff. Wallet: Something I don’t want to forget! My wallet is from Prada and fits everything perfectly. I think I may do a full review on it because it compact and so gorgeous! Makeup: I chose to wear a more balm lipstick. The YSL Rouge Volupte Shine Lipstick in No.6 Pink Devotion is one of my favorites. It’s a beautiful shiny pink. It is moisturizing which is perfect for these winter months. Lastly, I carried a little sample of a Chanel perfume and my Nivea lip butter in Rasberry Rose Kiss, which literally smells like candy. The last two things: I carried my tickets and of course, my phone! My phone case is from Tory Burch! We later went and got some sushi and Sunda, which was delicious. I was too hungry to take pictures! Sorry! Haha! Next time! What do you carry on a night out? Broadway shows are incredible! I've never been to one in Chicago I've only been to the ones in New York. My cousin has been in a bunch of Broadway shows and after a show I went up on the stage and my goodness I can't imagine doing it! There were so many seats and the lights were just blinding. Great post! The stadium looks amazing! I went saw Mary Poppins in NY a few years ago and absolutely loved it! I can't wait until I can go see another!